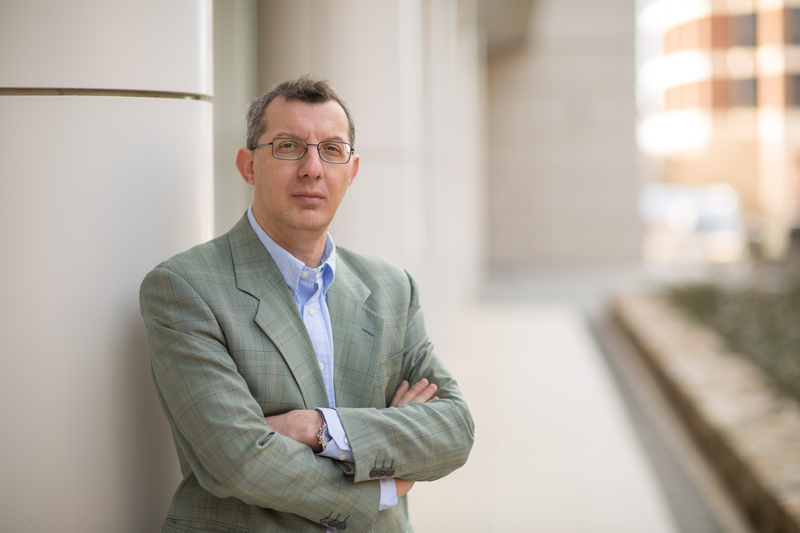 A team led by UNC Lineberger’s Gianpietro Dotti, MD, has engineered immune cells to hunt glioblastoma, the most lethal primary brain tumor. They presented their findings in Science Translational Medicine. UNC Lineberger’s Gianpietro Dotti, MD. CHAPEL HILL – An international team of researchers has genetically engineered cancer-killing immune cells that can hunt brain tumors displaying a new molecular target that is highly prevalent on brain cancer cells. Based on the findings from their early, preclinical studies, the researchers believe their approach holds promise for a new immunotherapy treatment for glioblastoma, which is the most lethal primary brain tumor. In the journal Science Translational Medicine, researchers from the University of North Carolina Lineberger Comprehensive Cancer Center, in collaboration with the Fondazione Istituto di Ricerca e Cura a Carattere Scientifico in Milan, Italy, report they modified immune cells to hunt brain tumors displaying a new molecular target called CSPG4, which they determined is highly prevalent on brain cancer cells. Their preclinical studies of immune cells engineered to recognize CSPG4 showed promise for controlling tumor growth in mouse and cell models for glioblastoma. New treatments are sorely needed for the disease, as conventional treatments, which can include surgery, radiation and chemotherapy, typically produce a survival benefit of less than a year and a half. Only about one-third of patients with brain and other nervous system cancers live five years. The study is part of a research program launched at UNC Lineberger to develop personalized immune-based treatments called chimeric antigen receptor T cell, or CAR-T, therapies. This approach involves removing a patient’s immune cells and genetically engineering them to recognize and attack cancer. Other centers have launched CAR-T clinical trials for glioblastoma, but the UNC Lineberger team designed immune cells that hunt CSPG4, a different target on the surface of glioblastoma cells that they believe could be more potent than other targets. Dotti and his colleagues report they were able to genetically engineer immune cells called T-cells to attack glioblastoma cells displaying CSPG4. Since CSPG4 was highly expressed in 67 percent of their brain cancer samples, they believe this could be a more effective approach to CAR-T cell therapy for a significant number of patients with glioblastoma. Other investigational therapies have genetically engineered immune cells that recognize different targets, such as epidermal growth factor receptor variant III (EGFR III), IL-13Ra2 and HER2. Researchers reported that one issue with other approaches has been tumor “heterogeneity” – in which glioblastoma cells do not all express the target, allowing some cancer cells to evade detection by the T-cells. UNC Lineberger researchers found that T-cells genetically engineered to target CSPG4 controlled the growth of tumor cells in multiple models of the disease. In cell cultures, the engineered T-cells efficiently eliminated glioblastoma cells displaying CSPG4, while the cancer continued to grow in the presence of regular T-cells. The engineered T-cells also prolonged survival and controlled tumor growth in glioblastoma models in mice. In addition, they discovered a mechanism to potentially increase the potency of the investigational therapy by upregulating the expression of the CSPG4 target on tumor cells. In mouse studies, high levels of a molecular signal called TNF-alpha was linked to increased expression of CSPG4. Researchers believe exploiting the TNF-alpha pathway could make CAR-T cell treatments that target CSPG4 more effective. Overall, the researchers said the early studies showed promise for CAR-T cell treatments that target CSPG4. UNC Lineberger researchers have already launched clinical trials for CAR-T cell-based therapies in patients with blood cancers, but Dotti said they are planning to try to investigate this approach for solid tumors as well. “It is our intention to extend this therapeutic approach to solid tumors, and glioblastoma is one of the tumors that we are planning to treat in the near future,” Dotti said. Dotti, along with Barbara Savoldo, MD, PhD, assistant director of the UNC Lineberger Immunotherapy Program and professor in the UNC School of Medicine, and Jonathan Serody, MD, UNC Lineberger’s associate director of translational research and Elizabeth Thomas Professor in the UNC School of Medicine, plan to launch clinical trials for glioblastoma in partnership with UNC Lineberger’s Matthew Ewend, MD, Van L. Weatherspoon Jr. Eminent Distinguished Professor and chair of the UNC School of Medicine Department of Neurosurgery, and UNC Lineberger’s Simon Khagi, MD, director of UNC Lineberger’s brain tumor program and assistant professor in the UNC School of Medicine Division of Hematology/Oncology and Department of Neurosurgery. As envisioned, the trial would focus on patients with advanced disease that has recurred and requires additional surgery. To further ensure the safety of patients participating to the future study, researchers plan to incorporate a so-called “safety switch” into the therapy that would allow for the rapid elimination of the T cells in case toxic effects are observed. In addition to Dotti and Savoldo, other authors were Serena Pellegatta, Natalia Di Ianni, Cristina Corbetta, Yuhui Chen, Monica Patané, Chuang Sun, Bianca Pollo, Soldano Ferrone, and Francesco DiMeco, Gaetano Finocchiaro. The study was supported by the University Cancer Research Fund. Pellegatta, a visiting scientist from Italy who worked in Dotti’s laboratory at UNC Lineberger, received support by Il Fondo di Gio Onlus from Italy.